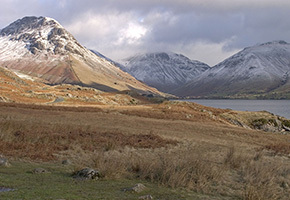 Cumbria's Highest Mountain acts as the bouncers for the remote Wasdale Head in Gosforth . The tiny village doesn't offer much more than a local pub and a few farms, but it does boast England's deepest lake and its highest peak, along with the second smallest church in the country. The small town does offer a great selection of local produce including ale and cheese and a superb range of local meats.